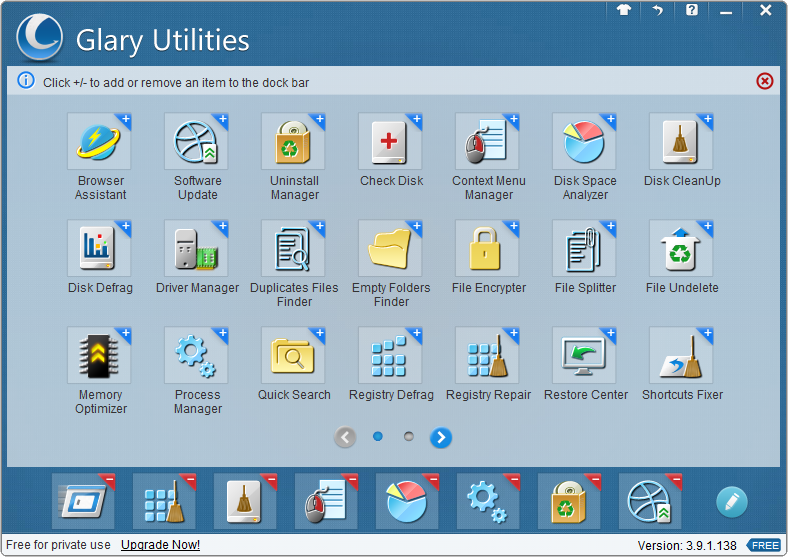 Glary Utilities is a all-in one free system maintenance solution for Windows user. Glary Utilities provides wide range of Windows optimization and system maintenance utilities that are designed to fix, speed up, maintain and protect your computer. Glary Utilities allows you to clean common system junk files, as well as invalid registry entries and Internet traces. You can manage and delete browser add-ons, analyze disk space usage and find duplicate files. It is designed for both novice and professionals. User-friendly interface shows clear and detailed directions. For novice, all work can be done with just 1 or 2 clicks, while for professionals, abundant options are available. Glary Utilities gives you handy tools to optimize Windows registry and clean junk file to free up disk space, secure your privacy protection, Windows performance accelerator and many other amazing multifunctional tools. It can fix dogged registry errors, wipe off clutters, optimize internet speed, safeguard confidential files and maintain maximum performance. You can also view and manage installed shell extensions in Windows, encrypt your files from unauthorized access and use, split large files into smaller manageable files and then rejoin them. 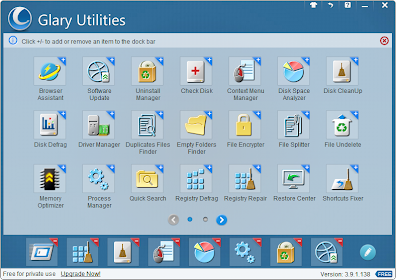 Download free Glary Utilities 3.9. Glary Utilities file size 15.5MB.